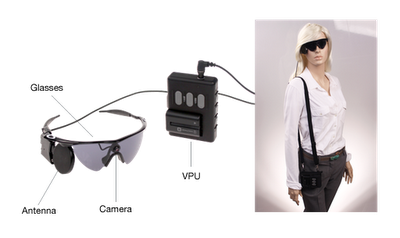 The Argus II retinal prosthesis system is called the bionic eye. It is a retinal implant that is used to send image data straight to the brain. The California company, Second Sight, developed Argus II. Their goal with the Argus II is to provide sight to people who have been blinded from outer retinal degenerations, such as retinitis pigmentosa. Retinitis Pigmentosa is an eye disease where the retina of the eye is damaged. The retina is locaated at the back of the eye and is responsible for converting light images to nerve signals that the brain can interpret. The Argus II works by bypassing damaged photoreceptor tissues in the eye. The patient wears special eyeglasses that houses a small video camera, wireless transmitter, and is connected to a small computer worn by the person. The camera captures the image which the computer processes and converts into data that the brain can understand. The wireless transmitter then sends these signals to the eye implant which transmits it directly to the optic nerve, sending the signal directly to the brain. The eye is implanted with a wireless receiver that receives the data from the glasses and an electrical array that sends it straight to the optic nerve. (See video below). The optical system is named after the Greek mythological giant, Argus Panoptes. Argus had 100 eyes and was the servant of the goddess, Hera. Argus was considered all-seeing and was relied upon by Hera to stand guard and monitor things. The U.S. Food and Drug Administration (FDA) Ophthalmic Devices Advisory Panel unanimously voted 19-0 that the probable benefit of the Argus II Retinal Prosthesis System outweighs the risks to health, an important step toward the FDA market approval of this product manufactured by Second Sight Medical Products, Inc. In making this determination, the panel spent ten hours carefully reviewing and discussing data submitted from the international clinical trial of this innovative retinal implant that, for the first time ever, partially restores vision to patients who are blind due to Retinitis Pigmentosa (RP). "We are very pleased with the panel recommendation today. The panel deliberations were well informed and thorough and their decision validated over two decades of work by Second Sight and our collaborators," said Robert Greenberg, MD, PhD, President and CEO of Second Sight. "We would also like to thank all of the people around the world with Retinitis Pigmentosa who volunteered to participate in our clinical trials, and the doctors who treated them. Without their pioneering efforts, today's result would not have been possible." The panel, which was comprised of 19 voting members with expertise in ophthalmology, retinal disease, low vision, electrophysiology and other specialties heard testimony from Second Sight, the US Food and Drug Administration, and several doctors and participants involved in the most recent clinical trial that began in 2007. After hearing the testimony, asking questions, discussing concerns, and carefully deliberating, the panel voted unanimously that the probable benefit of the Argus II Retinal Prosthesis System outweighs the risks to health. This recommendation came after more than 20 years of work in the field, $200M of public and private investment, and 10 years after the first person received Second Sight's first Bionic Eye in the clinical trial of the first generation Argus I retinal implant which began in 2002. Many of the hundreds of people that have played instrumental roles in the development of Argus II were moved by the panel recommendation. 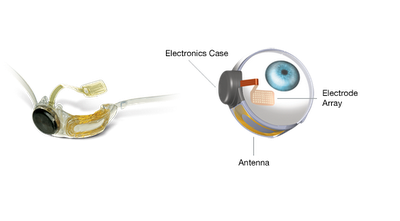 "While the European Approval last year was based on the safety and the long term performance of the Argus II Retinal Prosthesis System, the FDA panel required the demonstration of probable benefit as well. This recommendation will now give us the chance to improve the quality of life of thousands of blind patients who have absolutely no other treatment options", said Dr. Lyndon da Cruz, MD PhD Consultant Retinal Surgeon at Moorfields Eye Hospital in London, UK who presented the international trial data to the FDA panel in Washington. "The landmark nature of the moment was reflected by one of the largest FDA panels ever convened and there were numerous patients who had benefitted from the device giving moving testimonies of how the device had changed their lives". "With seven patients treated in Moorfields Eye Hospital, the largest clinical site in the world, I am very proud to have participated in the world's biggest trial of any retinal implant, and that our research work in the NHS has been seminal in allowing blind patients around the world to get access to this unique and life changing treatment. With both European and recommended US market approval of Second Sight's Argus II bionic eye an historical first has been achieved. We can now begin to see great hope in the future development of this field and the promise of restoration of sight for those who need it most". Professor Paulo Stanga, Vitreoretinal Surgeon at Manchester Royal Eye Hospital and Director of the Manchester Vision Regeneration (MVR) Lab, UK, added, "In Manchester, we enrolled three subjects in this trial, and obtained some tremendous results. In further research, we have been able to demonstrate that patients blinded by retinitis pigmentosa could consistently perceive different colors at the same time using Argus II. This data is very encouraging because it suggests the possibility that Argus II with its software capability could be upgraded to one day restore color vision for these blind patients." "I think it's a terrific system, it's wonderful, it's changed my life. I just like to be part of something that does something for other patients with retinitis pigmentosa" said Keith from Manchester, user of the system since 2009, in a statement to the FDA panel. "This is a truly exciting and historic moment for people with advanced inherited retinal degenerations such as retinitis pigmentosa," said Dr. Stephen Rose, chief research officer, Foundation Fighting Blindness, which helped get the project started with early support. RP, an inherited retinal degenerative disease that often results in nearly complete blindness, affects roughly 200,000 Europeans and has been designated by the World Health Organization as an orphan disease. In 2011, the Argus II, which is intended to help the RP patients with complete blindness, received a CE Mark, making it the first approved treatment for severe retinitis pigmentosa anywhere in the world. "We have seen a tremendous acceptance from the German and Italian government to bring Argus II to Retinitis Pigmentosa patients at no cost for patients, and we hope to see a similar level of support from England, France and other European countries", said Dr Gregoire Cosendai, head of Europe for Second Sight.